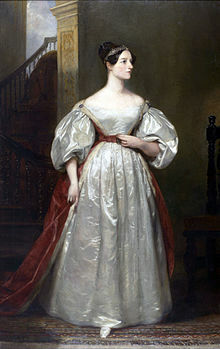 Ada Lovelace (1815-1852) was daughter of George Gordon, the poet better known as Lord Byron, but her greater claim to fame lies in writing the first computer programs…before any computer existed to run it. She wrote the program for Charles Babbage’s Analytical Engine, so she had a design to build for, but Babbage was never to build the computer: it was too ambitious, too expensive, and frankly nothing like it existed in the 19th century. (Babbage’s own lack of focus no doubt helped sink the project as well.) Nevertheless, Lovelace’s programs had all the basic features computer languages possess today, including flow control (“if-then-else” statements, etc.) and the manipulation of symbols. The concepts she wrote about in 1842 are still taught in modern numerical programming courses today, including the one I taught last fall. Ada died of cancer at age 36. Last year, I celebrated Emmy Noether, perhaps the greatest mathematician of the 20th century. This year (largely because I’m swamped with other work), I’m stealing a great idea from Ed Yong, and celebrating living writers who are my friends, colleagues, and influences. This list is in no particular order, isn’t anywhere close to complete, and has some overlap with Ed’s list. My main criteria are that these are writers I read regularly, so their interests mix with mine to some degree. (Writers marked with an asterisk* are people I have met in Real Life, whatever that signifies.) Leave your own favorites and influences in the comments! Marie-Claire Shanahan* writes about general issues in science education, science communication, gender in the culture of science, and (awesomely) the connection between science and music. Her recent post “Why is it so hard to give up on hoping that facts speak for themselves?” is a great introduction to her writing and general themes. Jennifer Ouellette* has the Cocktail Party Physics beat: physics and related subjects with a fun spin. She’s one of my blogging role models: she takes real, important science and presents it in clear language that anyone can understand. Amy Shira Teitel* is an historian of spaceflight. Her knowledge of the American and Russian space programs is encyclopedic; I’m waiting for her definitive book series on the subject. Her latest is an excellent skeptical take on Felix Baumgartner’s skydive, which definitely made me rethink my positive view of the experiment! Emily Willingham* is a force of nature. Not only is she the Fearless Leader of Double X Science (where I serve as physics editor), but she writes for Forbes, the Thinking Person’s Guide to Autism, and her own blog, while contributing to other sites like Slate. She’s a snarky voice of reason in a world of hype. Janet Stemwedel* writes about ethics in science and education, and the associated challenges of achieving gender parity. I’m making that sound boring, but her writing is far from it! In this era of rampant misbehavior, we need all the ethicists we can get—not to mention all the good writers. Her latest essay is a book review in honor of Ada Lovelace Day, covering an important 19th century astronomer: Maria Mitchell. Kelly Oakes covers the astrophysics beat at Basic Space. (You might recall she contributed to the Carnival of Cosmology back in July.) Herself a trained astronomer, she writes about recent research in astronomy and astrophysics in a clear manner—she could train reporters and press information officers. Her Ada Lovelace Day post honors astronomer Henrietta Leavitt, whose work paved the way for…well, pretty much all of modern cosmology. Sci Curious* is a disembodied brain…er, no, she’s a real person whose Secret Identity remains a mystery to me. She’s also a great and hilarious science writer at Scientopia and Scientific American. Jacquelyn Gill* is a paleoecologist: someone who studies ecosystems of times past. Her awesomely-titled blog, The Contemplative Mammoth, also covers a lot of important topics like sexism in the scientific community and the mental health of academic scientists. Deborah Blum wrote The Poisoner’s Handbook, one of the best nonfiction books I read in the last year. She also blogs, and her storytelling is unsurpassed. I want to write like her when I grow up. Rebecca Skloot wrote one of the other best nonfiction books I read in the last year: The Immortal Life of Henrietta Lacks. Read it. Dig it. Join us. Doctor Rubidium* is a chemist, whose preferred chemical reactions involve laughter (well, and booze). Don’t read her site if you’re allergic to humor, bad language, or learning stuff. Bug Girl* is taking a needed break, but go browse her archives for excellence in entomology (and (gulp) entomophagy). Joanne Manaster* writes, speaks, teaches, eats, and breathes science. I don’t think there’s an area of science she’s not interested in; we’ve crossed paths at planetary science workshops and science communication events. I can’t keep this up, even though I know I’m missing too many people still. Honestly, if I were to list the best science writers I know, the list would be nearly identical. The only reason to focus on gender to compile it is because our society is still sexist, and women’s accomplishments are too often denigrated. Part of the reason and motivation for Ada Lovelace Day is to highlight that problem, and try to correct it. Recognizing how many of the leaders of my own field of science writing (who daily kick my own astrophysics) are women is my way of doing that. Impressive list, but sadly misses out on Maryn Mack (Wired) and GrrlScientist (Guardian). If I were you, I’d also include Athene Donald (Occam’s Typewriter), a physicist herself, and Jennifer Rohn (also Occam’s Typewriter), cell-biologist and lablit author. I’d add @DNLee and @CarmenDrahl to the list. Thanks for including me! Thanks for the additions! And yes, these are all excellent writers, and I apologize for leaving them out. Trust me, there was no insult intended! Thanks for having me here. It’s a great list, and I’m too chicken even to try such a list because (1) it would be really, really long and (2) I’d end up leaving someone out whose writing I <3. Between this list and Ed's, though, you've certainly covered a large percentage, I think … definitely no way to go wrong reading the work of any of the women on these lists. I'm really starting to like Ada Lovelace Day! Yeah, I know I missed too many good writers, despite the long list! However, that’s a good sign in itself: we need more than one day out of the year for this.